That’s and interesting post, Alex, and I always love those calculated trend lines in the middle of a near-shotgun spray of data! It makes me feel insecure! 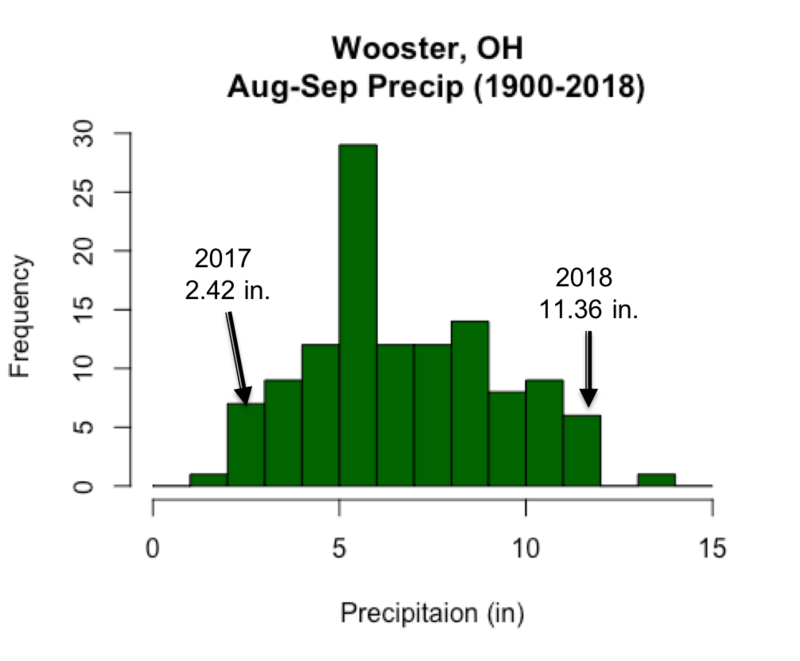 Here, just 45 minutes south of Wooster, my rain gauge has shown two 50″+ years in a row, and that’s an underestimate because I don’t have a good way to collect snow-precip data (although 2018 was very low on the snow totals). It would be interesting to accumulate data from across the state, and see how much variation there is, from place to place. Since so much of our summertime rain is thunderstorm-related, and that tends to be more hit-and-miss, it wouldn’t surprise me if some of those statistical ups and downs wouldn’t smooth out with more stations reporting, beyond the OARDC. I have definitely noticed a distinct decrease in the strength of our thunderstorms over the last decade, or so….A weakening of temperature contrasts in frontal interactions? Then, this all ties back into that old idea (which I posted about a year or two ago), where the breakdown in the boundary between Ferrell and Polar Cells, induced at least partially by excessive loss of Arctic ice (that Arctic-North Atlantic Oscillation hypothesis), causes some long term issues with the tenacity of the Polar Jet, and hence, the expeditious travel of weather across North America (and who knows how that interacts with El Niño and its/his brethren). Although I’m disinclined to be too narrow-minded about translating our incredibly variable weather into a statement about climate, this all has the (unscientific) feeling of an underlying truth, to me. Yeah, those fitted curves are approximate at best. The coefficients behind them are statistically significant, so I’m confident there’s been an increase in the dataset and that most of that increase comes from the early 20th century and recent decades, putting error bars on that would be discouraging. 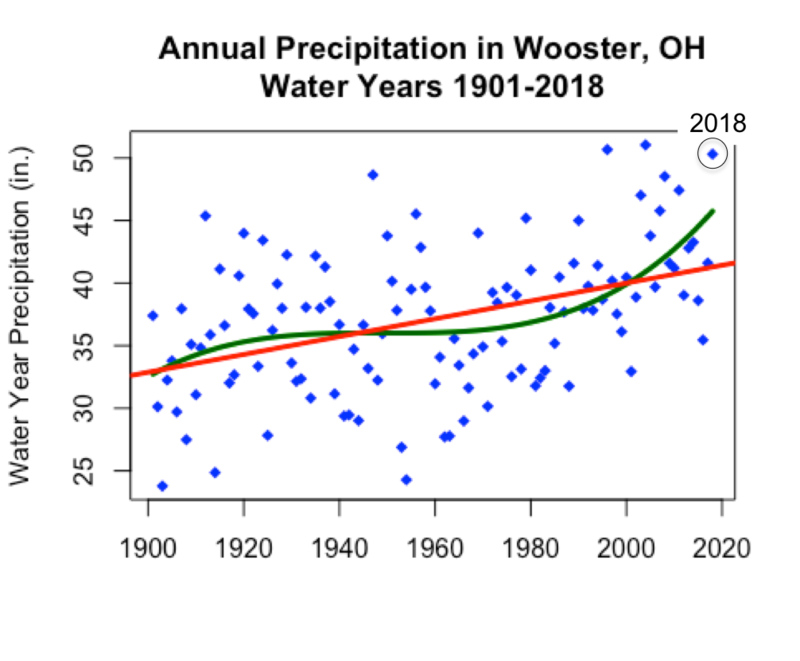 Based on a fairly recent conversation with somebody over at the Ohio State Climate Office (https://climate.osu.edu), I think somebody over there is doing the work of combining all the stations in Ohio to do this sort of analysis. Actually, I’m surprised that isn’t up on their website already. My guess is the same as yours – reduction in scatter and a tighter fit to whatever line-of-best-fit is present. As for the observations you made about thunderstorms, that’s quite interesting. When you say “strength”, are you referring to precipitation totals? wind speed? Both? There might be a way to test that sort of thing systematically with some of these stations that have wind measurements, although wind can be even more variable that precipitation from locale to locale. From my read, that theory about weakening of the polar front and slowing of propagation speeds in response to the Arctic warming faster has gained traction in a lot of scientific circles I interact with over the past few years. So even if you’re using instinct and feeling, it seems to be in good company. I know the two biggest arguments against the idea are 1) The tropics are the main driver of climate, not the poles and 2) that amplification of warming in the Arctic is mostly a surface feature… and the tropics are actually warming faster than the poles if you look high up in the troposphere (e.g., 10 km up). In other words, somebody like Clara Deser at NCAR is going to tell you that in isolation, reducing sea ice leads to warming at the surface in the Arctic, which does translate upward and monkey with the jet stream, but somebody like James Screen at Exeter in the UK is going to caution you that such a signal might be overwhelmed by whatever the tropics are doing (i.e., El Niño and all that, as you referenced). I see both arguments, although I do notice that the people who think the tropics are more important seem to often be the people who study the tropics. Anyway, for your observations, weaker thunderstorms could be a weaker polar front. That makes plenty of sense. I also would be open to the idea that they also result from the polar front being more often north of us than in the past, meaning that we get more convection-only storms, which are likely to be weaker here than a convection-baroclinic combination (i.e., a convective thunderstorm forming along a strong cold front). The way to test that would need confident, long-term records of thunderstorm strength, polar front/jet position, and polar front/jet strength. The first measure is probably the trickiest given the scale.